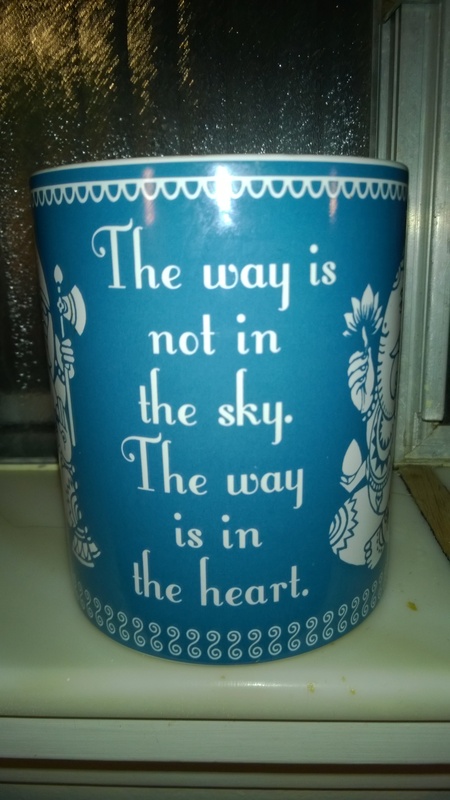 This simple mug, found at a local Ross for a few dollars, has a profound message. The way of an engaged and authentic human life is not to be found in the abstract ideals of dogma and speculations about eternal metaphysical systems. Rather, it is to be found in the concrete embodiment of this body, in the compassionate beat of your heart. In undertaking a spiritual life, what matters is simple: We must make certain that our path is connected with our heart. Many other visions are offered to us in the modern spiritual marketplace. Great spiritual traditions offer stories of enlightenment, bliss, knowledge, divine ecstasy, and the highest possibilities of the human spirit. Out of the broad range of teachings available to us in the West, often we are first attracted to these glamorous and most extraordinary aspects. While the promise of attaining such states can come true, and while these states do represent the teachings, in one sense, they are also one of the advertising techniques of the spiritual trade. They are not the goal of spiritual life. In the end, spiritual life is not a process of seeking or gaining some extraordinary condition or special powers. In fact, such seeking can take us away from ourselves. If we are not careful, we can easily find the great failures of our modern society–its ambition, materialism, and individual isolation–repeated in our spiritual life. Of course, we are individuals, bodies with extremely sensitive nerves which intimately map all the pains and pleasures that the world offers us. We seek out the positive sensations that these senses perceive, and as such, of course we desire these higher goods, ultimate “goods” or the purest pleasures one might say, promised in spiritual pursuits. This is what gets us started. Otherwise, why would we begin? In any path, even if advanced, there will be some small shadow of that egoistic motivation. That’s why Dōgen, one of the greatest Zen ancestors, says: “Those who greatly realize delusion are buddhas. Those who are greatly deluded in realization are living beings” (Genjōkōan in the Shōbōgenzō). To put this as simply as I can, as embodied individuals with a limited perspective, we struggle to realize the greater picture of a huge, interconnected, flowing universe of which we are part (in fact, not “part” per se as this can imply separation–there is no separation). We create elaborate stories of “Me” and accumulate myriad possessions as “Mine”. One particularly cutting and separative term I’ve experienced many times of this type is “My Truth”. This individualizes and upholds the ego’s limited perception above all else, thereby glorifying the Self as spiritual ideal (what Chögyam Trungpa would call “spiritual materialism“) and misunderstanding the concept of truth as well (for example, while a schizophrenic’s experience of a hallucination is true insofar as we can believe that he or she experiences it, it is not true in the same sense as “Water freezes at 32°F.”). From our limited perspective, we can aspire to greater understanding, insight, and experience. This is why buddhas greatly realize delusion–out of their self-centered motivation, they begin practice. They are also living beings (a buddha is clearly a living being! ), still feeling some sense of separation and individuality even when realizing the greater truth that all is one. Hence, they are greatly deluded in realization. The danger here for Dōgen is as Kornfield mentioned. A path without heart can mean: “Furthermore, there are those … who are deluded within delusion.” Those are the practitioners of spirit who get trapped in their pictures of the world, their fabrications, and their value systems. They fall into their own fantasies of being heroes or heroines. Rather than compassionately and vulnerably opening their hearts to the universe, this is selfishly putting on armor to protect their ego, their persona, their “story”–it’s a security blanket. I’ve said that a way with heart is embodied rather than abstract and openly vulnerable and compassionate rather than egoistic and self-protective. The Buddhist idea of bodhicitta is the perfect expression of this. It translates to “awakened heart” or “noble heart”. However, citta in Sanskrit means both mind and heart in English. They don’t have quite as clear of a distinction as we do in the English language. However, this is apt – the heart (poetically meant) has an understanding–a very visceral and experiential one that grounds more than the airy concepts of the mind (from our Western understanding of “mind”). The heart pumps life throughout our entire body day in and day out for our entire lives–taking the air and nutrients from the world and circulating it through our entire bodies, making that external stuff into our bodies and taking the waste of our bodies to be returned to the world. Last, but perhaps most importantly, the heart is the symbolic organ of compassion–with phrases like “opening your heart” or “have a little heart”. The heart chakra is a perfect example of this in the Indian energetic system of the chakras–the point of connection, compassionate connection rather than individuated separation, with all life and existence. It is the symbolic seat of being open to and aware of the sacredness and wonder of everything rather than the self-centered idea of “My Truth”. In fact, in some of my reading about the heart chakra, I’ve read that developing and focusing on the energy of this green, open chakra can be the most fundamentally beneficial energy healing practice, and this position resonates well with the symbol of Yin-Yang (actually called Tai Chi, meaning supreme ultimate or universal harmony) in the Chinese energy practices of Qi Gong and Tai Chi. My point is that bodhicitta, “the awakened heart”, is the open, tender connection of the spiritual practitioner to the universe. It’s the compassionate engagement that brings a gentle support of all people–recognizing their confusion, pain, and human ways, ways needing compassion and guidance without the self-certain way of dogma (which is basically rigid opinion) or the sterile and abstractly disembodied ideals of some belief systems. Bodhicitta, the perfect example of a way with heart, opens us to wonder at the universe and to compassionate action towards all. Like Ganesha on the cup, bodhicitta removes obstacles in our way, giving us a path forward, without it being a pre-constructed one; rather, we create the path with each engaged step of practice. This is a way that is in the heart and protects us from Kornfield’s identified failures of ambition, materialism and individual isolation. Help me make the crossing. Help me find the path. Help me walk it gracefully. 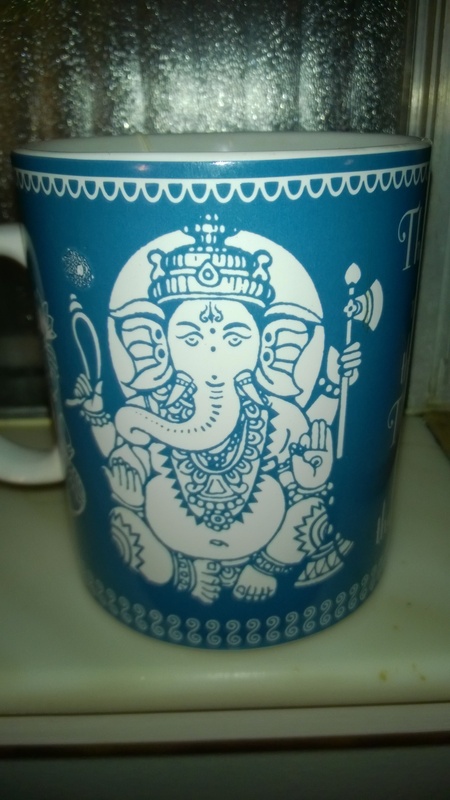 I’ve been drawn to Ganesha as a symbol of overcoming obstacles recently. Plus, he’s just rad! Perhaps he can be an image to keep in mind while reciting this mantra to help empower you and hone your focus on the intention. I was told recently that the secret of Ganesha is that he not only removes the obstacles for you but is also the one who put them there in the first place. If this is the case, the ordeal of the obstacle and the overcoming it have a meaning and a lesson for you. In getting beyond them, make sure that you are learning what you should from them. Don’t simply try to run away from the process. Good luck on your journeys!